Authentic Tuscan Style Sardine and Shrimp Zoodles is a simple dish made with quality ingredients. Zucchini noodles, cherry tomatoes and shrimp; topped with pasta sauce and a garlic, sardine, and olive oil spread. My love of Italian food must come from it’s simplicity of bold flavors. That almost sounds contradictory, but it’s entirely true. Most classic dishes use only a handful of ingredients, but quality its key. Tomato, basil, garlic and olive oil go a long way to add impressive flavor to almost any dish. These Tuscan Style Sardine and Shrimp Zoodles are an example of this bold simplicity. Includes about five premium, high-quality ingredients. 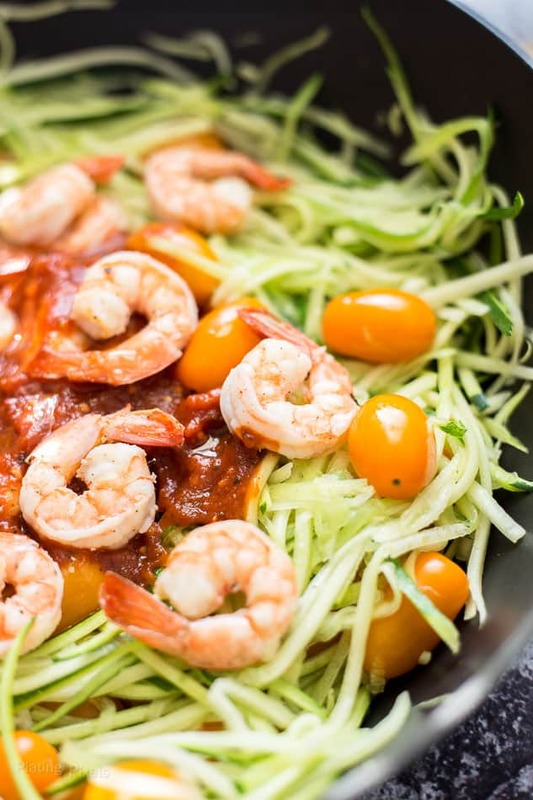 Should be cooked quickly and lightly; this shrimp zoodles recipe can be made in about 20 minutes. Has visual texture and each ingredient is recognizable within the dish. Includes layering to create optimal flavor balance. This Tuscan Style Sardine and Shrimp Zoodles is a simple recipe made with only a handful of key ingredients, each adding its own distinct flavor. First we start with a homemade sardine sauce. Sardines and high quality extra-virgin olive oil adds omega-3 heart healthy nutrients. Minced garlic balances this out and adds bite to the salty, fishy profiles of the sauce. 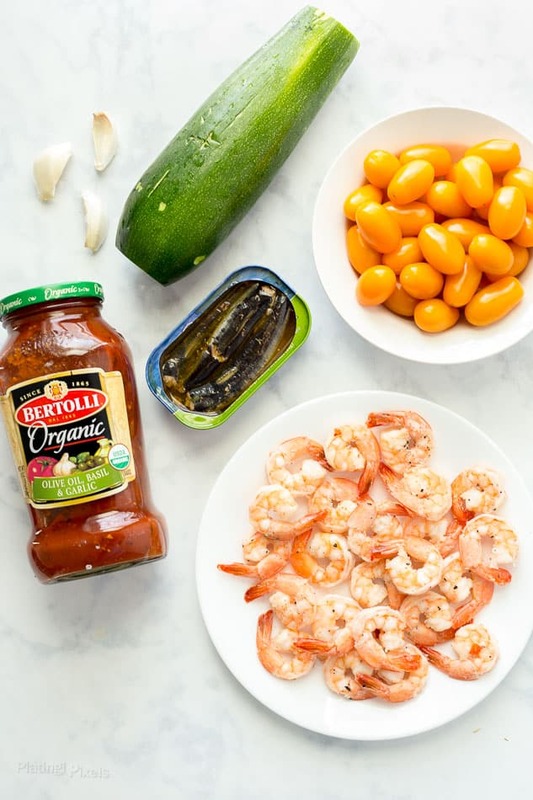 Sauted shrimp adds protein and tender texture that compliments the crunch of zucchini noodles and the pop of cherry tomatoes. This recipe is low-carb and gluten-free, but you can substitute or add in whole-wheat or any type of pasta. The final touch that brings all this together is quality pasta sauce. I used Bertolli Organic Olive Oil, Basil and Garlic. Made simply with a few organic ingredients and herbs, it’s authentic flavor you’d be proud to add to your dish. Learn more about the Tuscan Way of cooking. With this rich pasta sauce base, and just a few additional ingredients you can have an authentic Tuscan-Style meal in almost no time. Texture: Crisp zucchini noodles with tender shrimp. 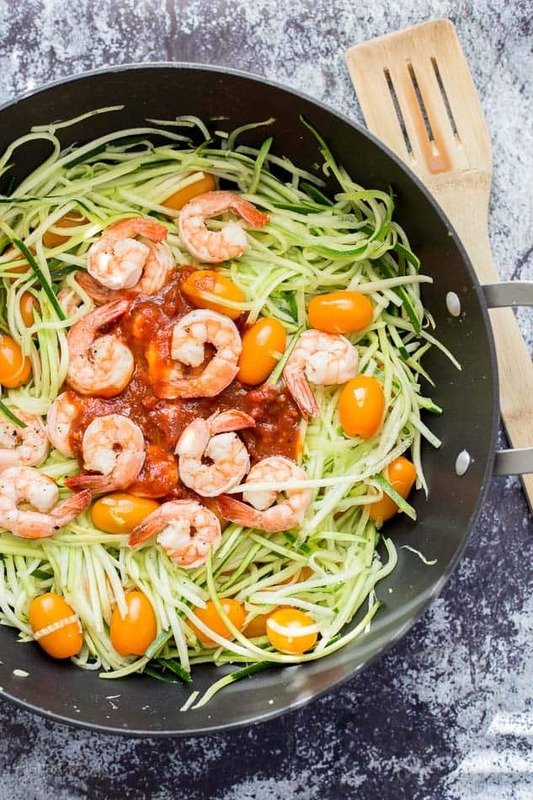 Low-carb, healthy and gluten-free shrimp zoodles pasta that's high in protein and omega-3 healthy fats. Heat 3-tablespoons olive oil in a small saucepan over medium heat. Stir in sardines and garlic. Cook until heated through, mash with spoon as it cooks to create a sauce. Remove from heat. Heat 1-tablespoon olive oil in a large non-stick pan or skillet over medium-high heat. Add shrimp and sprinkle with salt and pepper. Cook 5-7 minutes, rotating halfway, until cooked through and opaque. Remove from pan. 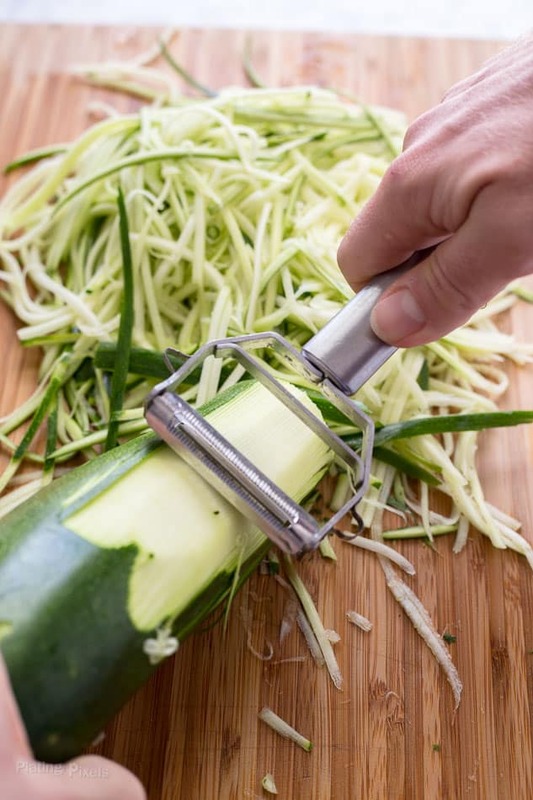 Using a spiralizer or julienne peeler, create zoodles strips from zucchini. Lightly press with paper towels to draw out excess moisture. Heat cleaned pan to medium-high heat. Stir in zoodles and cherry tomatoes with remaining tablespoon of olive oil. Saute 2-3 minutes until heated through. Stir in pasta sauce and cook 1-2 minutes more to heat through. To serve: Dish out desired amounts of zoodle mixture and top with sardine sauce and cooked shrimp.